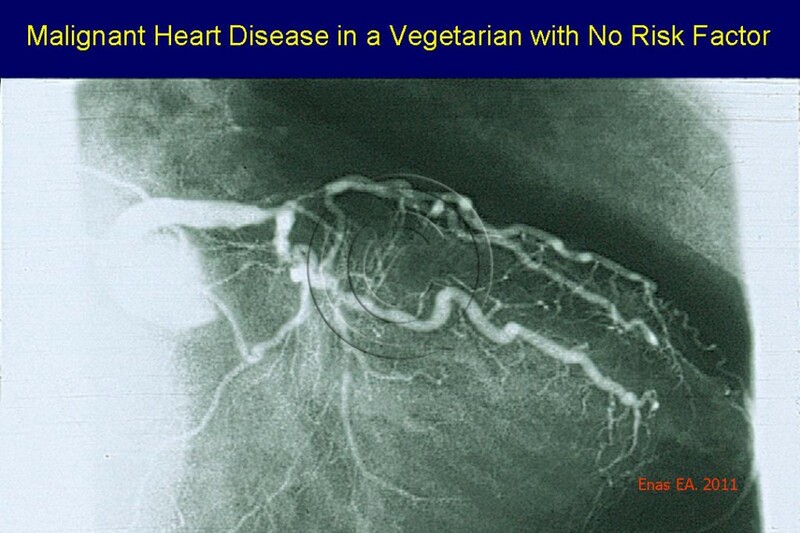 Figure 002 shows malignant heart disease in a vegetarian with none of the traditional risk factors. He had 75% narrowing of the left main artery and 99% narrowing of the left anterior descending artery (“widow-maker” artery) and multiple narrowing of the left circumflex artery. 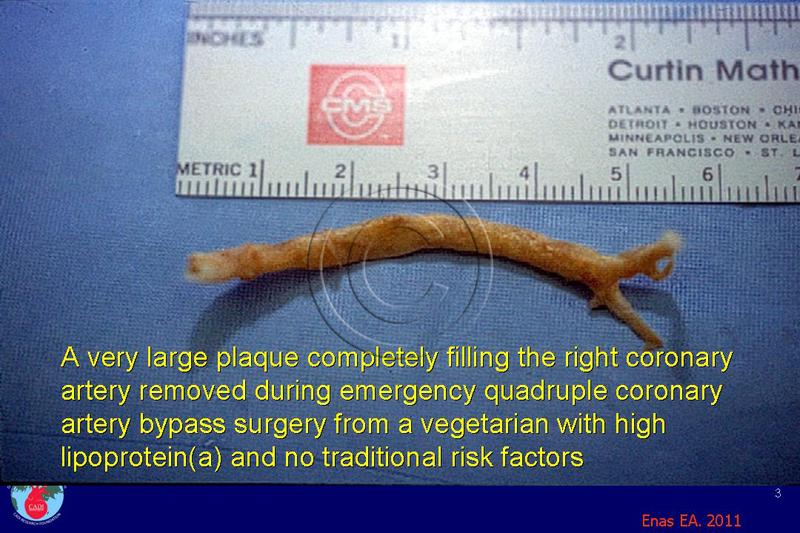 Figure 003 shows the amazing endarterectomy specimen that completely blocked his right coronary artery removed en-mass during emergency quadruple bypass surgery. For more information see prematurity, severity, cardinal features, and classification. 1. Enas EA, Mehta J. Malignant coronary artery disease in young Asian Indians: thoughts on pathogenesis, prevention, and therapy. Coronary Artery Disease in Asian Indians (CADI) Study. Clinical cardiology. Mar 1995;18(3):131-135. 2. Indrayan A. Forecasting vascular disease cases and associated mortality in India. 2010;http://www.whoindia.org/LinkFiles Sept 25, 2010. 3. Enas EA. Why Indians are more susceptible to Coronary artery disease: Role of specific risk factors In: Chatterjee SS, ed. Update in Cardiology Hyderabad: Cardiology Society of India; 2007. 4. Enas EA. Why is there an epidemic of malignant CAD in young Indians? Asian J Clin Cardiol. 1998;1:43-59. 5. Zimmerman FH, Cameron A, Fisher LD, Ng G. Myocardial infarction in young adults: angiographic characterization, risk factors and prognosis (Coronary Artery Surgery Study Registry). J Am Coll Cardiol. Sep 1995;26(3):654-661. 6. Sharma SN, Kaul U, Wasir HS, et al. Coronary arteriographic profile in young and old Indian patients with ischaemic heart disease: A comparative study. Indian heart journal. 1990;42(5):365-369. 7. Pahlajani DB, Chawla MH, Kapashi KA. Coronary artery disease pattern in the young. J Assoc Physicians India. 1989;37(5):312-314. 8. Enas EA. 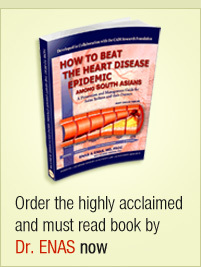 How to Beat the Heart Disease Epidemic among South Asians: A Prevention and Management Guide for Asian Indians and their Doctors. Downers Grove: Advanced Heart Lipid Clinic USA; 2010. 9. Enas EA, Yusuf S, Mehta JL. Prevalence of coronary artery disease in Asian Indians. Am J Cardiol. Oct 1 1992;70(9):945-949. 10. Lowry PJ, Glover DR, Mace PJ, Littler WA. Coronary artery disease in Asians in Birmingham. Br Heart J. 1984;52(6):610-613. 11. Bhalodkar NC, EA E. Malignant Coronary Artery Disease and the Asian Indian Paradox Proceedings of the 13th International Congress on Heart Disease Conference, New Trends in Research, Diagnosis, and Treatment 2007:157-164. 12. Krishnaswami S, Prasad NK, Jose VJ. A study of lipid levels in Indian patients with coronary arterial disease. Int J Cardiol. 1989;24(3):337-345. 13. Pinto RJ, Bhagwat AR, Loya YS, Sharma S. Coronary artery disease in premenopausal Indian women: risk factors and angiographic profile. Indian heart journal. 1992;44(2):99-101. 14. Dave TH, Wasir HS, Prabhakaran D, et al. Profile of coronary artery disease in Indian women: Correlation of clinical, non invasive and coronary angiographic findings. Indian heart journal. 1991;43(1):25-29. 15. Gupta M, Brister S. Is South Asian ethnicity an independent cardiovascular risk factor? The Canadian journal of cardiology. Mar 1 2006;22(3):193-197. 16. Kaul U, Bhatia V. Perspective on coronary interventions & cardiac surgeries in India. Indian J Med Res. Nov 2010;132(5):543-548.